An exciting write-in activity book for little children packed with dozens of castle-themed activities and lots of stickers. Children can learn how to draw a medieval knight and lady, spot villagers in the castle courtyard and fill a battlefield with stickers of fearsome warriors riding off to war. Activities include step-by-step instructions for drawing a knight and lady, spot the difference and matching puzzles, mazes, colouring and dot-to-dots and a big battle scene to complete with amusing stickers of knights. 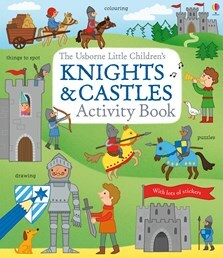 Includes snippets of information about knights and castle life, with puzzle answers included at the back of the book.